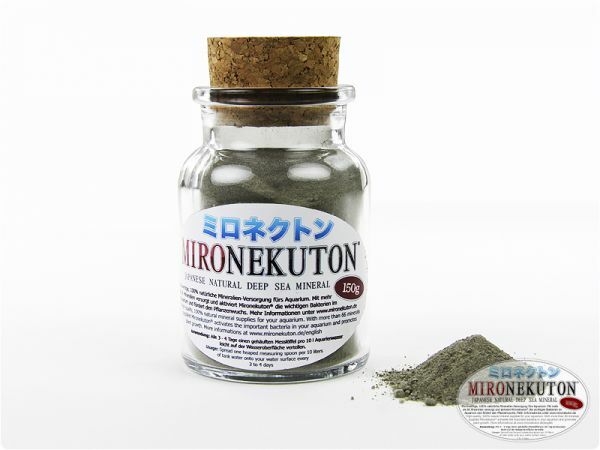 The original Mironekuton® from Japan is a mineral powder, 100% natural and without additives. Due to its manifold beneficial characteristics it is highly popular with Japanese shrimp breeders and plant tank keepers, especially in combination with soil subtrates, as it significantly enhances the all-important microbiology (bacteria, accompanying fauna). In Japan, the powder is mixed into the substrate as soil additive when the tank is set up. Fill a substrate layer into your tank, cover it thinly with Mironekuton® and then add the rest of the substrate. After the tank has been decorated and filled with water, a little Mironekuton® is sprinkled on the water surface so that it spreads evenly in all the tank when sinking. Put in a heaped measuring spoon (approx. 0.4 g) of Mironekuton® Mineral Powder to every 10 litres of tank water every three to four days. Mironekuton® Mineral Powder is also highly suitable for mixing into your self-made shrimp food as it is an effective mineral supplement. It can also be used for re-mineralising RO water, fully and partially demineralised water and to condition and to remove noxious substances from rainwater. Mironekuton® has a pH of 7.4. A high dosage added to soft water will raise the pH value and total hardness and will also have a small impact on carbonate hardness (KH). These characteristics are important for stable water parameters and a well-balanced bacterial flora in your tank. Verifiable by common water tests, minerals are given off slowly and continuously, thus offering a great advantage against artificial and /or quickly soluble mineral additives. 50 g of Mironekuton® to 10 litres of RO water re-mineralise the water and thus increase the parameters after 24 to 48 hours to approx. GH 4, KH 1-2, pH 7.4, conductance 75 µS. Die Ware ist vollkommen in Ordnung, schnelle Lieferung, jederzeit wieder, sehr zu empfehlen.